A perfect weeknight dinner in winter. Nothing compares to Baigan Bharta on cold winter evenings. Made by roasting farm fresh large Aubergines, chillies, and tomatoes over charcoal till the skin is charred and the vegetables cooked till they are soft and mushy. The Cooking the vegetables over direct fire gives it a lovely smoky flavour. This simple dish makes a healthy and sumptuous dinner when combined with phulkas, jowari roti or palak roti. If you do not have access to coal, you can roast the baigan, chilies and tomatoes over the stove top. Baingan bharta or Baingan ka bhurtha or Baingan da bhurtha or Wangyacha Bharit (Mashed Eggplant) is a South Asian dish bearing a resemblance to baba ghanoush. Baingan bharta is a part of the national cuisines of both India and Pakistan. It is primarily a vegetarian dish that comprises bhurtha (minced vegetables) made from eggplant (baingan) which is grilled over charcoal or direct fire, to infuse the dish with a smoky flavour. The smoked eggplant is mashed with fresh cilantro (coriander leaves), chili pepper, onion and mustard oil. Traditionally, the dish is often eaten with an Indian flatbread (specifically roti or paratha) and is also served with rice and/or raita, a yogurt salad. Baingan bartha is also eaten in Bangladesh. In Maharashtra, especially in northern parts known as Khandesh, “Vangyache Bharit” as they call it is served in social gatherings including wedding ceremonies. During harvest season, special “Bharit Party” is organised. Baharit is usually served with “Puri”. In Vidarbha and Khandesh regions of Maharashtra, two variants are popular “kachha (raw) bharit” and “phodni cha (with tadka) bharit”. In kachha bharit, all the ingredients except eggplant are used raw (uncooked). Raw spring onion, tomato, green chillies, green coriander and some times fresh fenugreek leaves are mixed with flame roasted eggplant along with raw Linseed oil or peanut oil. In “phodni cha bharit”, above ingredients are first fried in oil with spices and then mashed eggplants are mixed in it and cooked together. The similar process is followed in other Indian states and Pakistan with slight variations on ingredients. 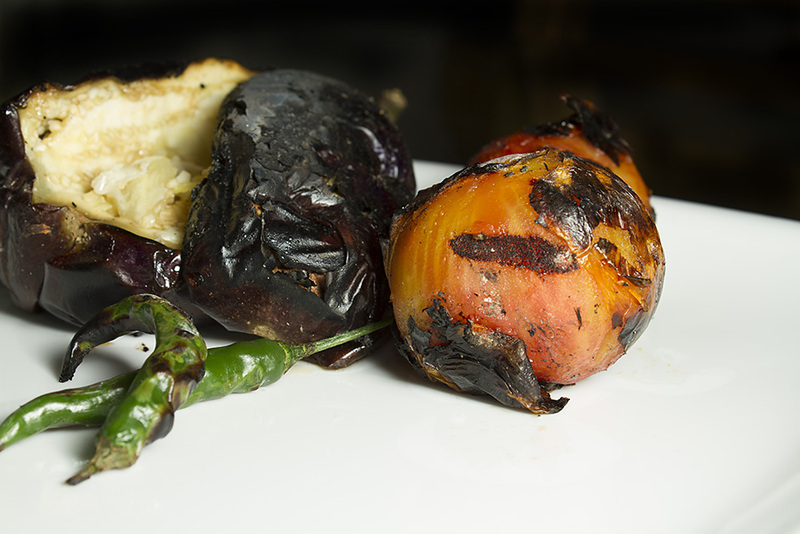 In Vidarbha and Khandesh, it is considered a delicacy when eggplants are roasted on a dried cotton plant stems which gives a distinct smokey flavour to the dish. The dish is served with dal, bhakri and rice. Slit the Baigan lengthwise (do not cut it, just make slits) and stuff them with ginger and garlic juliennes. Roast the stuffed Baigans, Tomatoes and Chillies on fire. I use traditional wood charcoal fire to roast them, but it can be done on the stove top as well. Let the Baigan cool, remove the skin and mash them to a pulp. Chop the roasted tomatoes and chillies. In a pan, heat oil add the white portion of spring onions, add chopped tomatoes, chillies followed by the mashed Baigan. Fry it for a few minutes, add salt and sprinkle the greens of Spring onions. 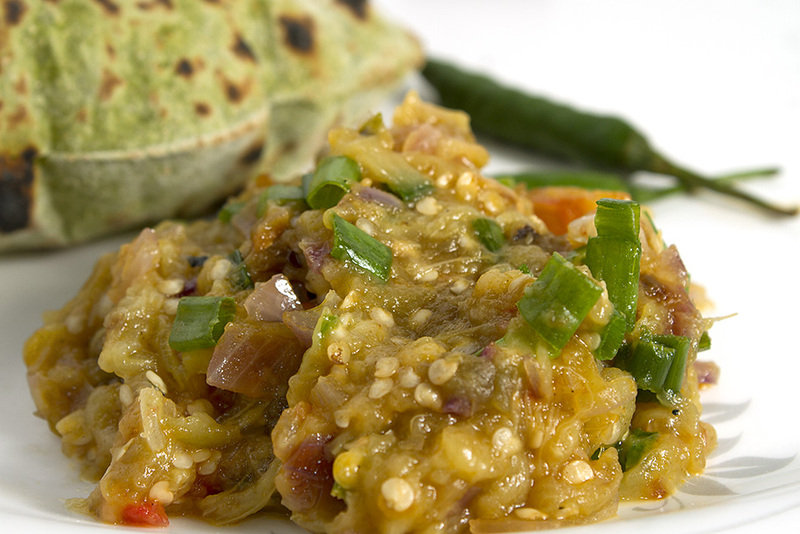 Serve hot baingan bharta with Jowar Roti, Palak roti or hot phulkas. Delighted to have come across this site. I just love the simplicity of your recipes. I am not Indian but I do enjoy cooking Indian food at home. Thank you so much. So happy to hear from you. Will reply to your email in a bit.